"The J. Geils Blues Band was playing a gig in late ’68 or early ‘69, unbelievably enough, at Worcester Tech, the school I attended when we first moved to the area. And as we were packing up, a kid came up with that guitar." "It had a different tailpiece, the pick guard was missing, and it had been varnished with a brush, but I knew what it was. He said, “Do you wanna buy this guitar. I need 600 bucks.” I said, “I don’t have $600, but I have this Les Paul Custom I just paid $600 for… I’ll swap.” And he did." "I took the guitar to Eddy Murray and told him to make it look like it was supposed to. He scraped away the varnish and we found the parts it needed. In keeping with the times, I took the covers off the PAFs. 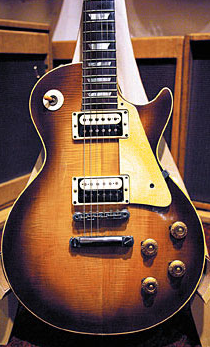 That guitar – I call it the “lunch pail Les Paul” – and that amp (points to a tweed Gibson GA-40) were used on almost all the solos on all the J. Geils Band records we ever did."